The American Civil War was fought between the Northern and Southern States. Nullification, States rights, Slavery and Abolition were all causes of internal discord. Preceding the outbreak of armed hostilities there was a period of simmering tensions wherein the United States was tearing itself apart. This division began to be represented on flags. In 1844 William Lloyd Garrison's Anti-Slavery Almanac displayed on the verso cover an image of a stylized 26 star U.S. flag with 12 white stars and 14 black stars. Eventually this strife was graphically displayed in Exclusionary Flags - those flags which excluded, for whatever reasons, stars for one group of states. 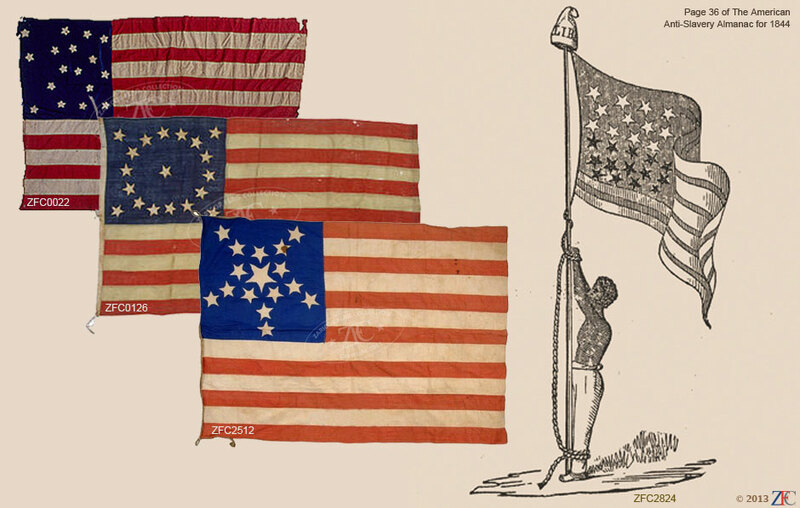 Abolitionists began to use flags which excluded the slave states. Not to be outdone Southerners displayed 15 star flags representing only the slave states. Eventually the nascent Confederate States of American began to solicit designs for flags to represent their new confederation and included here is such an example. Ultimately tensions broke and Fort Sumter in Charleston harbor was fired on by the Confederacy. The flags on the fort were of the extremely rare "diamond" pattern, which is represented by a 29 star version.